Chemistry.com tells it’s customers that it has a “formula” to match you and your perfect love. When signing up for the site you answer a number of questions. Now we know my attention span for this kind of thing isn’t great which may be why I clicked “Enjoys watching sports”. Even with my lack of attention to the questionnaire I expect the proven formula to be something more than “picking names out of a hat”. Which, based on experience, seems to be what they do. 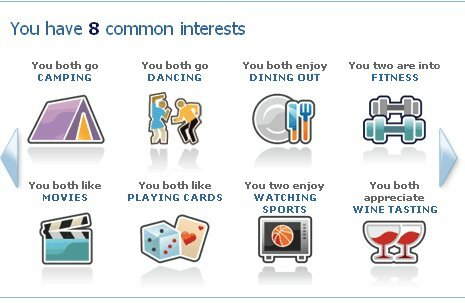 As an example 1 of my “matches” today (I only had 2 so 50% of my matches) showed that we had “0” common interests. ZERO. How exactly did we get matched up? And really how does this guy get matched up with anyone? Above is a picture of my common interests with a past match. So if ZERO guy doesn’t like to dance, camp, go out to dinner, drink wine, play cards, go to movies or watch sports …. what exactly does he like to do?